Starting to feel the budget blues? As you’ve no doubt quickly learned, weddings can be very expensive. But that doesn’t mean you can’t find ways to save money on your big day. 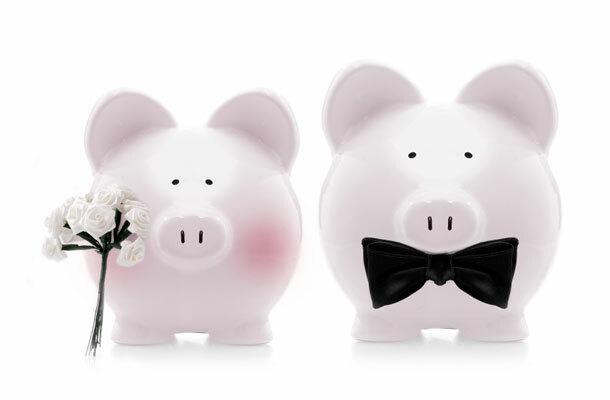 Here are nine money-saving tips to plan an amazing wedding without blowing your budget. 1. Rank your top three. Sit down with your fiancée and determine the top three or four areas where you want to allocate the majority of your wedding budget, such as food, photography and entertainment, for example, and then stick to them. This will help you cut back and save on other areas of the wedding that aren’t as important to you or that you may not really need, perhaps such as flowers or favors. 3. Consider a wedding planner. While hiring a wedding planner may seem like an unnecessary luxury, it may actually be a money saver in some cases. Planners often have many tried and true connections in your area and know about off-the-beaten-path venues or up-and-coming vendors you’ve never heard of that can be less expensive than some of the usual suspects. 4. Choose the right venue. A more expensive wedding venue that already closely resembles your dream vision will often cost less than selecting a less pricey venue that looks nothing like you had in mind. If you have to bring in chairs, linens, silverware, glassware and décor, those additional costs can quickly add up. Oftentimes, an all-in-one ceremony and reception venue can also be less expensive than booking two separate locations. 5. Trim the bar. While your guests will love it, an open bar is often the most expensive way to go. Cut costs by serving just one or two types of beer and wine or a signature cocktail. Having just a few kinds of liquor on hand will go a long way toward saving overall costs. And as long as guests can imbibe, they won’t mind the scaled down options. 6. Pick seasonal flowers or go faux. To save money on flowers, select blooms that are in season, as opposed to ones that have to be grown in a greenhouse or flown in from another part of the world. Another option is to mix in beautiful silk florals along with live ones to cut overall costs, or even forgo flowers altogether. 7. Skip the giant wedding cake. Instead of spending a fortune on a large, multi-tiered wedding cake, get more mileage out of a smaller one- or two-tier decorated cake by supplementing it with a large sheet cake to add more pieces for guests to enjoy. Sick of cake anyway? Consider alternative options such as serving pie or setting up a yogurt bar instead. Another fun and affordable option is to create a dessert table with an array of homemade desserts baked by family and friends. 8. Consider alternative entertainment. If lively music isn’t one of your must-haves, forget the large band or DJ and save money by hiring a guitarist friend to play during dinner or your first dance. Another option is to create an iTunes playlist ahead of time and enlist a wedding party member to keep things moving when necessary. 9. Pass on favors. Are favors a lovely gesture if you can afford them? Yes. Will anyone really miss them if you don’t? Doubtful. Forgoing favors is an easy way to save money without sacrificing any wedding details your guests will actually notice. Which of these tips will keep your wedding budget on track? Let us know below. This entry was posted on Tuesday, March 18th, 2014 at 8:48 am	and is filed under Planning + Advice. You can follow any responses to this entry through the RSS 2.0 feed. You can leave a response, or trackback from your own site. I usually push for #3 of course but also 3, 5, and 9. These constantly are visited when discussing $$$ and staying within a set budget. Great tips! Trimming the cake and party favors are a good idea.